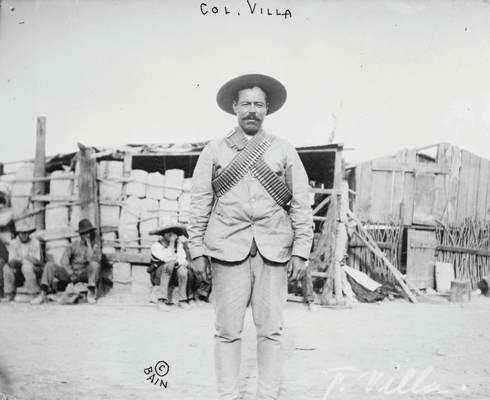 On March 9, 1916, Mexican revolutionary leader Pancho Villa and a band of Villistas attacked the town of Columbus, New Mexico. They burned and looted and engaged in a three-hour battle with the U.S. Cavalry that ended at 7:30 a.m., when Villa’s remaining men fled back into Mexico. Ten U.S. civilians and eight soldiers with the 13th Cavalry were killed, as were up to 150 of Villa’s raiders. Why, you may wonder, am I writing about something that happened 99 years ago in a desolate town few people have ever heard about? Thank you for asking. I worked as a reporter for the Las Cruces Sun-News several years ago, serving as bureau chief in Deming, about 35 miles north of Columbus. My duties: to find feature stories and news articles about anything of interest that happened in a 50-mile radius. I loved that job. There was a nearby stable where I could exercise my love of horseback riding when I wasn’t working. Deming had a couple of restaurants that served great Mexican food. At night, if I got bored, I could simply drive to Columbus, cross the border into Mexico, and drink good Mexican beer or tequila for 35 cents a tumbler while pretty señoritas danced to a mariachi band. One of the stories I covered was the annual Border Donkey Race, sponsored by Howdy and Yahooskin Fowler to help celebrate the Pancho Villa Days festival. Howdy was a Bronco Billy type of guy—an expert shot, a superb roper, and a trick rider who had actually formed his own Wild West show in the tradition of Buffalo Bill Cody and Annie Oakley. Yahooskin, his wife, was a beautiful Cherokee woman. When Howdy performed his show, she unflinchingly posed for him while he threw knives or fired pistols at balloons taped to a board behind her. After the couple folded their show, they set up housekeeping in a cowboy shack with a corral and began raising donkeys. Howdy and Yahooskin used the beasts in their daily efforts to spread the gospel, and turn a profit, too. Their mini-ranch, where they lived in a small trailer, contained a wooden corral that housed half a dozen donkeys. The ranch was halfway between Deming and Columbus, about six miles from where I lived and worked. I never tired of visiting them. “What is a Christian donkey?” I ventured. My editors loved the idea of covering the annual event and even paid my entry fee to ride in the race. First prize was an extremely covetable $500 belt buckle made of turquoise, gold, and silver. The race was two weeks away, and Howdy and Yahooskin thought I should practice riding Isaac. We began meeting at their ranch on the prairie after work. Howdy had a big buckskin horse, and Yahooskin rode a donkey named Betsy. Isaac turned out to be a sturdy donkey with a strong back, long ears, and a bray that made my eardrums vibrate like walloped gongs. Yahooskin handed me an apple. “Feed him this. He’ll fall in love with you,” she said. Isaac took the apple out of my hand and chomped it in two bites. On the morning of the race, six other riders showed up. The mayor, police chief, cheerleaders from the local high school, and a delegation of Mexican dignitaries were there, along with a television crew from Las Cruces. Howdy climbed on his horse as we lined up the mules at the starting line. He pulled a pistol from his holster, pointed at the sky, and fired. The race was on. I kicked Isaac and slapped his neck with the reins, trying to get him to run. Isaac just plodded along, following the other animals, while the television crew trailed with their cameras. Yahooskin took the early lead. Her white donkey, Betsy, had a purposeful stride and looked like she meant business. Howdy galloped up alongside me. “Better get Isaac in gear,” he said. “If you don’t, my wife’s gonna make a donkey out of you.” Slapping his horse on the rump with his Stetson and a “Yee-haw!” he broke into a gallop for the benefit of the cameraman. Covering 20 miles across the prairie lands of southern New Mexico on the back of a donkey is an ordeal that tests a rider’s courage, not to mention his backside and his pain threshold. The eight of us were stretched out over about a half-mile, and it was hot. Yahooskin had the lead, and I was running— make that walking—second. I shifted my weight every way possible, but nothing worked. I was in pain and needed rest and a soft bed—fast. Somehow I stayed on the donkey’s back, gritting my teeth and wishing I had never gotten myself into this marathon. As we came within sight of the finish line, a strip of ordinary flour about a foot wide that ran across the road, Yahooskin was in the lead by more than 100 yards. I was riding second. She bent low over the donkey’s neck, urging the animal to a greater speed. I did everything to Isaac but build a fire under him. Oh well, I thought: Second place is better than third. That’s when it happened—the miracle. People in the wooden stands and crowding the street were cheering. The high school band was playing. Yahooskin raised her arms to blow kisses to the crowd. She was only 10 feet from the finish line, well in the lead, when her donkey slowed to a stop. One foot from victory. It was glorious. I trotted past Yahooskin and crossed the finish line. But when I tried to stand up, I couldn’t move. I somehow made it home, but I couldn’t get out of bed for two days. The only solace came from looking at the beautiful belt buckle they had awarded me. Life is good. And one of these days, with just a little luck, I think Yahooskin might even speak to me again. Geno Lawrenzi Jr. lives in Springfield, Missouri.